Synergy-ISO-7 is the answer to the all-in-one conundrum, it’s also an answer to the prayers of those seeking complete nutritional synergy. Synergy-ISO-7 is a premium product designed to maximise the various needs of all modern-day athletes. Modern-living demands we all have busy lives and these time constraints can often seriously hamper our nutritional choices. It is not very often that we have time to eat 6 times daily, let alone find time to take the individually-packed supplements we need to progress. With Synergy-ISO-7, all our result-producing supplemental-requirements are taken care of in one great-tasting bar. Each bar is 70g. Chocolate Mint Flavour: Protein Blend (Milk Protein, Hydrolysed Gelatine, Hydrolysed Wheat Protein, CreaPep™ (Partially Hydrolysed Whey Protein (Milk), Micellar Casein (Milk)), Whey Protein Isolate ((Milk)), Emulsifier: Soya Lecithin), Dark Chocolate Couverture (14%)(Sugar, Cocoa Mass, Cocoa Butter, Emulsifier: Soya Lecithin; Flavouring), Humectant (Glycerol), Peppermint Fudge Style Icing (10%) (Sugar, Non-Hydrogenated Palm Oil, Glucose Syrup, Water, Skimmed Milk Powder, Salt, Emulsifier: E472c, Preservative: E202, Flavouring, Thickener: E401, Colours: E142, E161), Fructo-Oligosaccharide, Glucose Syrup, Creatine Monohydrate, Fat Reduced Cocoa Powder, Flavourings, Maltodextrin, Dextrose Monohydrate, Medium Chain Triglycerides, Rapeseed Oil, Avena Sativa (Oats), Magnesium Oxide, Fructose, Vitamin C, Vitamin B6, Antioxidant (Mixed Tocopherols), Zinc Oxide. 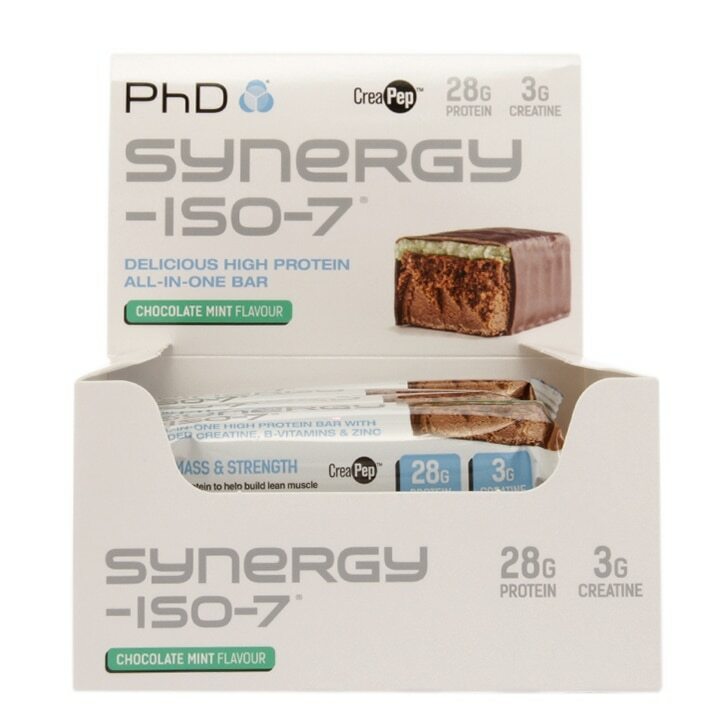 PhD Synergy ISO-7 Chocolate Mint is rated 2.0 out of 5 by 3. Rated 1 out of 5 by shawn91 from i hope theres something less than a star, honestly definitely needs some determination to finish the bar, don't try this at home unless you've not tried chalk! Rated 4 out of 5 by ddd29 from good quality The perfect composition of nutrients. Good quality, mint flavor makes it more enjoyable. The main drawback is no choice of flavor besides chocolate, for those who do not like chocolate it's not very good. I would prefer some fruit or just vanilla.